PHASE 1 - red line&apos; plrs work in pairs and in the first phase they for two laps of the field starting from station A then stop for 60 seconds for water then they complete 4mins of lapping the field at half pace &apos;key in this phase is that plrs maintain half pace running throughout the 4mins&apos;this improves aerobic levels with in plrs . . . PHASE 2 - blue line&apos; plrs now sprint from station A to station C have 30 seconds rest then sprint to station B again 30 seconds recovery then it is a sprint to station D&apos; 30 second recovery and finally sprint to station A to complete circuit this will be mirrored four times and increases the plrs an-aerobic levels . . 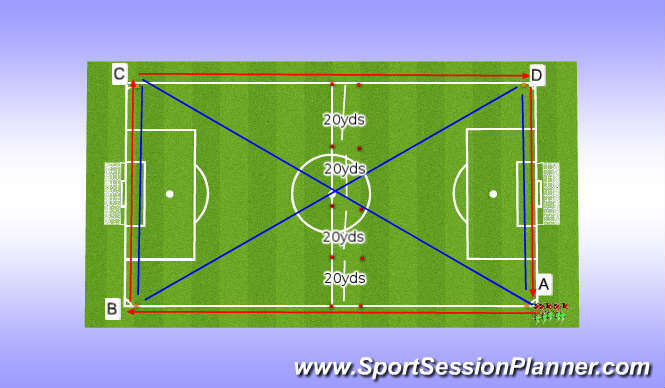 PHASE 3 - white line&apos; situate cones along lenght of pitch approx 20yds apart and instruct plrs to run from first cone to second at half pace then from second cone to third at three quarter pace this is mirrored along lenght of pitch and again back down pitch to starting position rest/recovery for 60 seconds and repeate the amount of repetitions depending on plrs fittness levels . . .